Tens of millions of victims are needlessly tormented by the agony, misery and assault of regular relentless migraine attacks. Misinformed, they are the vulnerable targets of greedy pharmaceutical companies. Smug white-coated authorities are brainwashing and deceiving them into believing that migraine was `an incurable genetic disease that causes swelling and inflamation of blood vessels around your head`. This insiduous lie pretends to validate the sufferer's illusion of helplessness by declaring the attack symptoms to be the only problem. That way sufferers are kept sick and so forced to rely on drugs; enslaved for sales and profit. Desperate migraineurs have had enough of this terror regime. They demand honest answers and effective solutions. Understandably, they've lost hope and trust, feel left alone with this invisible and unpredictable tyrant that nobody cares to understand. 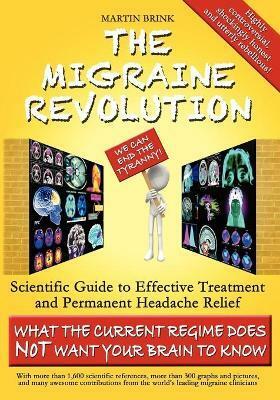 They fearfully tip-toe around potential `triggers` and worry that people think: `It's just a headache, barely real.` The Migraine Revolution empowers the fed up reader with a comprehensive and comprehensible summary of the latest science. It presents a wide variety of weapons for body, mind and brain to terminate the tyrant's terror, backed by more than 1,600 scientific references, explained by more than 300 graphs and pictures and with many awesome contributions from the world's leading migraine clinicians.